ELATED LOT: Masing (fifth right, second row) and Lai (on Masing’s left) in a photocall with recipients after the dividend presentation ceremony. MIRI: Native Customary Rights (NCR) issues will no longer become a ‘hot topic” in the impending 13th general election as land owners have grown wiser after seeing how the government has helped them. The opposition will be proven wrong if they thought NCR issues could still bring them political mileage, said Tan Sri Dr James Masing, Minister of Land Development, here yesterday. “The people are becoming more alert and understanding of the real concept of surveying NCR lands, which aims to recognise the rights of the people to the land and not confiscate them as alleged by the opposition,” he said at the presentation of dividends to participants of the Sarawak Land Development Board (SLDB) Oil Palm Mini Estate project in Beluru near here yesterday. Masing said there was growing awareness among the people that the government was sincere in wanting to help them measure their NCR land in order to make sure that their rights were protected. He hoped efforts to survey all NCR lands in the state could be completed within the next two years. Masing advised the people to give their full cooperation to the Land and Survey Department to smoothen the whole process. 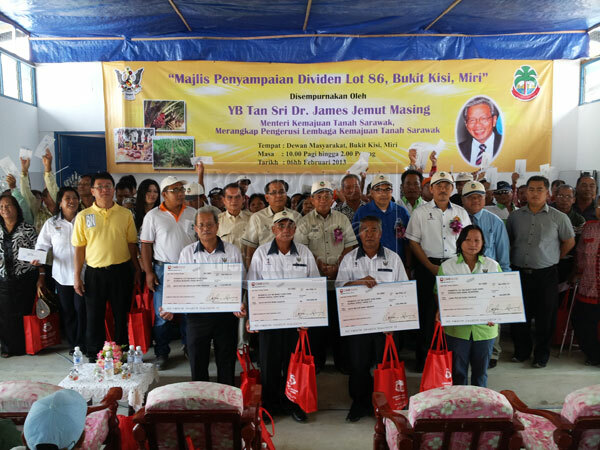 At the gathering, Masing presented dividends amounting to RM360,000 to 72 participants in the mini oil palm plantation project at Lot 86, Bukit Kisi, here. Also present at the event were Sibuti MP Ahmad Lai Bujang and Lambir assemblyman Ripin Lamat.